SpringBoard provides a professional learning system for every stage of implementation. We want to help you make SpringBoard a success in your school or district. So from the start, we work with your staff. We make sure your teachers know how to make the most of the program—and have the guidance they need to keep developing their skills. That means ongoing training and support for teachers, instructional coaches, and administrators at every stage of implementation, through our professional learning system. Our comprehensive offerings include multiday, face-to-face workshops and events for SpringBoard teachers; special-focus workshops; targeted training for instructional coaches; on-site observation and feedback; and online professional learning options. Here are just some of our professional learning offerings. Initial Teacher Institute: This three-day training gives new SpringBoard English Language Arts or Mathematics teachers everything they need to start using the program effectively. Examining Student Work: In this one-day training, teachers learn to collaborate in grade-level teams to examine student work and identify trends that inform instruction. Differentiating Instruction: In this one-day training, teachers explore the SpringBoard program's resources for differentiating instruction and learn how to use them to address the needs of English language learners, special education students, and gifted and talented students. Initial Administrator Workshop: In this half-day workshop, administrators and district leaders learn how to monitor SpringBoard implementation and what an effective implementation looks like. Learning Walks: This service brings SpringBoard experts to schools to observe classrooms, monitor progress, and offer schoolwide recommendations for improvement. These visiting experts are committed to your schools' success and give you informed, useful feedback. Administrators consistently rate Learning Walks as one of their most valuable professional learning experiences. 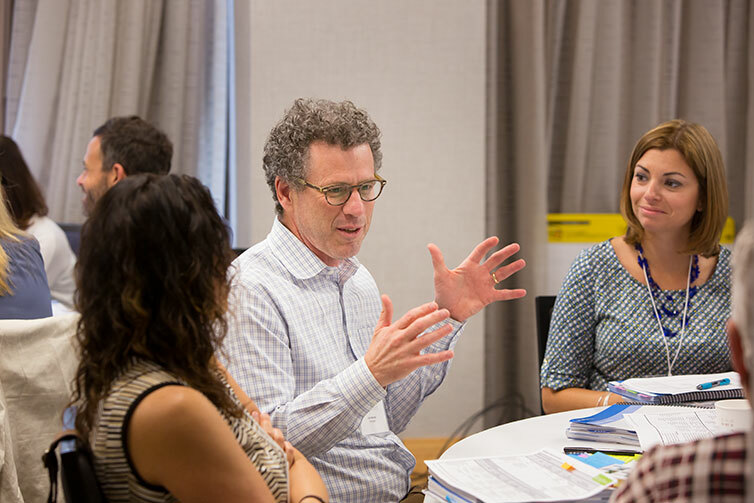 SpringBoard institutes, events, and workshops are led by SpringBoard National Faculty—master SpringBoard teachers who share their expertise and firsthand experiences. Attendees take an active part in professional learning. The facilitators model instruction, and participants learn from the student perspective to apply the program's instructional design in the classroom. Professional learning events are opportunities for SpringBoard teachers to learn from their colleagues as they master the program's methodologies, content, and implementation models. The hands-on, collaborative activities encourage teachers to engage with one another. Share best practices, ideas, and tips. Get feedback from experienced SpringBoard teachers. See recommendations and reviews of resources. Find resources and documents created by your peers—or upload your own. Watch video modules to support professional learning. SpringBoard users can access free e-Learning modules through SpringBoard Digital that complement our in-person professional learning offerings. Schools and districts can now purchase a professional development workshop to learn more about the SAT and how it connects to classroom instruction. This Professional Learning Workshop is available to both SpringBoard users and districts that are not currently implementing SpringBoard. "Connecting the SAT to Classroom Practice" shows educators how the SAT is tied to current coursework and how to use Official SAT Practice on Khan Academy® in the classroom. The CEU-accredited session is led by an English language arts or math teacher. For more information see the SpringBoard Professional Learning Catalog and use our contact for to learn more or to schedule a session. "Thinking back to my first experience—and again as a middle school teacher—it built my content knowledge, and I became incredibly confident about what I was doing in teaching rigor and what that looked like at my level." "One of the most powerful aspects of a SpringBoard training is that the people who are facilitating the training are SpringBoard teachers who know what it is like to teach SpringBoard every day to students." "It's really neat to watch how teachers grow within a week or within the three days that we offer training, but then [also] as the years progress. That it's not just a one-shot deal, that this is really a growth process that can help teachers to grow over a period of time." "SpringBoard was the most important single professional development experience I ever had because it's real, it's hands-on. You're engaging with colleagues, you're building a shared knowledge."